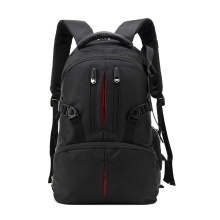 This backpack can carry a simple set of camera equipment, a 15in laptop and some daily necessities, it&apos;s the best choice for photographer. With detachable layers that can protect the camera and lens. There is an independent space in the backpack to put some groceries, such as clothes, washing and cleaning supplies. The side of the pack has a bag to hold your bottle. The separation can be adjusted according to individual needs. The bottom of the bag uses special waterproof material, easy to care.